The last Subaru WRX was, for lack of a better term, ugly as sin. This 2015 Subaru WRX isn't ugly. It has a bigger problem. It's boring. I've been cheerleading the WRX since it first leaked last week, even when I found out a CVT was on the menu. There's not much I like more than a fast, small, rally-bred sedan. I desperately wanted it to seriously wow me in person. Here's the thing: It doesn't. A WRX has always been a sort of counter-culture icon, a huge middle finger to economy cars with wings and scoops. It was an aftermarket car that didn't even have any aftermarket involvement. It had an interior that wasn't particularly great, looks that were ugly and aggressive, and was fantastic to drive. It might not have been the best looking car in the world, but at least it was interesting. While I believe that the new WRX, with it's 2.0 liter turbo four, 268 horsepower, and 258 pound feet of torque (it gets to 60 in 5.4) is fun and fast, it just doesn't look as rude as it once did. It's subdued up front. Out back, it has quad pipes and not much else to distinguish it from its lesser Impreza brother. 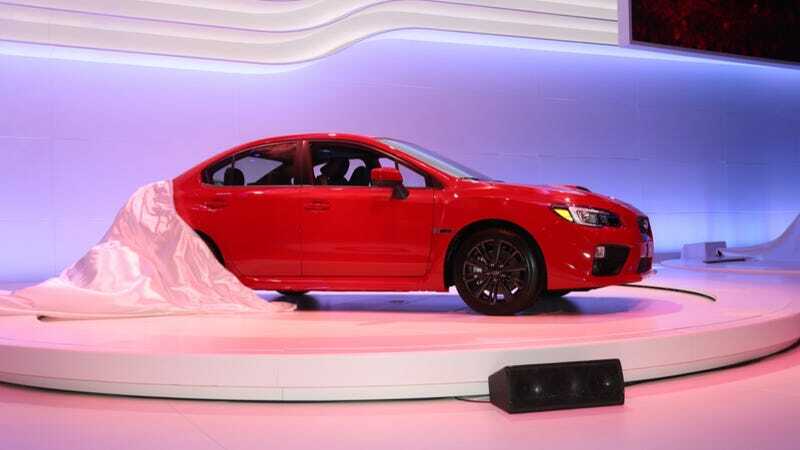 Instead of looking like a wild child,it looks like an Impreza Sport. The small wheels and non-aggressive fenders don't help. And now Subaru is talking about refinement. How it has a soft touch interior. A rude car isn't supposed to be refined. It's supposed to piss people off, owner included. The WRX has evolved, but it might have become too boring for its own good. At least we know one thing: High schoolers will still be spinning them off roads into the woods. It is the WRX way, and it always will be.